Superfish, a brand of Aquadistri, have launched 3 new energy efficient pond pumps that enable you to adjust the pump capacity to your required level. 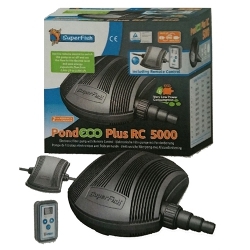 The Superfish PondECO Plus E with Remote Control enables you to switch on/off your pump and set the waterflow and jet to the desired level with 10 different variables. The RC 5000 has a pump capacity range of 2000-5000 litres / hour, with maximum head range of 0.9m - 3.0m and power usage rate of 6-22 watts. The RC 10000 has a pump capacity range of 4500-9200 litres / hour, with a maximum head range of 1.6m - 5.8m and a power consumption of 13-68 watts. The RC 15000 has a pump capacity range of 8000-15000 litres / hour, with a maximum head range of 2.5m - 6.5m and a power rate of between 23-130 watts. 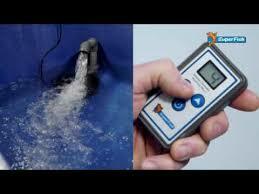 All three pond pumps in the range are suitable for submerged or dry-mounted use. They also come complete with run-dry protection to prevent the pump overheating should it run dry. Superfish offer a 2 year warranty and a 48 hour, on-site pick-up and replacement service with every model.